Attract Luck and amplify your energy! Amethyst aids in overcoming addictions, creates a deeper understanding, enhances memory, while dispersing rage, fear, and anxiety. It is very beneficial to the mind, creating a deeper understanding and enhancing memory. Clear Quartz brings clarity to the mind and aids in concentration. 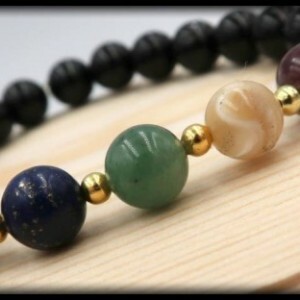 It connects to every chakra, allowing your mind, core, and base to work in harmony at their fullest potential. Black Onyx alleviates overwhelming fears and worries, helps to make wise decisions, absorbs energies from the universe to aid in healing. It also facilitates being the master of your own destiny, promotes vigor, and helps with accessing a higher guidance. The brilliant and beautiful White Jade signifies wisdom, and awakens your hidden knowledge. This stone brings harmony, attracts good luck, friendships, stabilizes your personality, and stimulates ideas while calming the mind. Symbolizing serenity and purity, it cleanses the energies of your heart, aids with emotional release, assist in recognizing yourself and hidden knowledge. 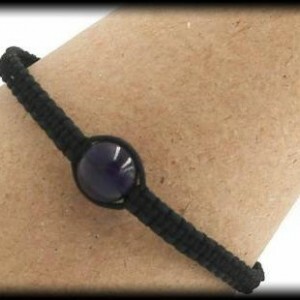 This item is made with 8mm beads of Black Onyx, Amethyst, Clear Quartz, and White Jade. SIZING INFORMATION Please measure your wrist with a measuring tape to ensure the most accurate measurement. If you do not have a measuring tape, you can also use a string by wrapping it around your wrist and then cutting the piece of string. After you have your cut string, place it alongside a ruler and write down your measurement. To ensure a perfect fit, please had 0.5 inch to your wrist measurement, if you want a little room please add .75 inches to your wrist measurement.